I might can my Amazon order for Missing & Ministry of Fear and order direct from Indicator. The problem with Amazon and these two titles is beyond a joke. To make matters worse I am on holidays for 6 weeks (I'm in France at the moment) and had everything set to be delivered prior to my departure. When these titles got delayed if Amazon had their act together they would have arrived either the day I left or the day after. I have a house sitter but was loathed to burden them with deliveries of Blu Rays - these two titles were the exception. My copy of Missing is finally shipping. My Ministry of Fear got shipped from Amazon today with Missing 'due' in a couple of weeks. I got it from Amazon. My Ministry of Fear is tacked onto my October pre-orders, so I don't know about it. I didn't order Oleanna, and Odessa File is still in limbo. You folks should have all ordered from Base.com. Same price, and I received both Missing and Oleanna last week. Amazon are just now preparing to ship my copy of Missing. 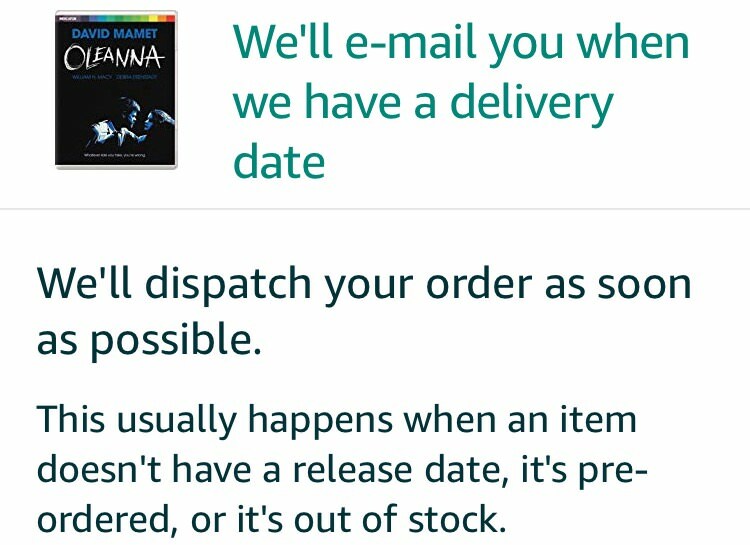 Just waiting for the release of Zama and that will be my last purchase from Amazon, given that they have barred Australians from buying from their international sites as of 1 July 2018 - to there credit they honoured pre-orders. I've already set my sights on other sellers. The Indicator problem at Amazon UK seems on its way to be corrected as Missing and Ministry of Fear are now listed as available from them (with a 1-2 days shipping delay on the latter, but that may change in the next hours). So people should see their patience rewarded as their pre-ordered copies start being dispatched. One would hope that Amazon has taken notice of htis incident and will implement the necessary measures for it not to be repeated on such a scale and involving one specific publisher's slate of new releases. Unless the issue was out of their control. Its still not in stock, but my Odessa File has finally shipped from Amazon. My preorder of Missing shipped early this week and I checked it’s status today and discovered it had been “delivered” somewhere in Germany on Wednesday. (I live in the US). I contacted them and they stated it had been returned as a result of parcel damage. It’s status as “delivered” though makes me wonder if they ever would have initiated a refund/replacement on their own. I’ll pay the extra money and order direct from now on I think. That's a 25% success rate so far. Born of Fire still hasn't dropped to 14.99 though...I'll cancel my Amazon pre-order tomorrow if it still hasn't. My card has a $270 charge from Amazon UK on it, so I am assuming the tragedy of Late August 2019 is not repeating, and all 15 of the things I pre-ordered for the month of September (including all four Indicators) are on their way. Huzzah. Lol the Born of Fire price just changed. Went from 21.09 to 22.99. Looks like Indicator launched a new website today. No wishlists, but there are accounts now and a different layout. I'm liking it so far, I think. Anyone else having trouble using their credit card on the new Indicator website? Mine was delined twice due to some testing error (on their part). I did it the third time with paypal and it worked. Powerhouse's shipping is always a bit steep (£4.90 for the first single title + £1.95 for each additional and £8.95 for each boxset). Don't know if this is a new change along with their new website (not sure I've ever bought anything from Indicator direct), but I just placed an order with them that incl. 2 box sets (I'm catching up), and was offered a choice in int'l shipping of either £x or FREE. No mention of what the difference was. Last edited by Adam Grikepelis on Thu Oct 18, 2018 7:37 pm, edited 1 time in total. When did last year's sale occur? Conveniently, this is preserved for posterity in the first post of this thread. Short answer though: around this time of year! Got it. In the future I will buy all of my blu-rays in October ever year and this really won't be a bad strategy.